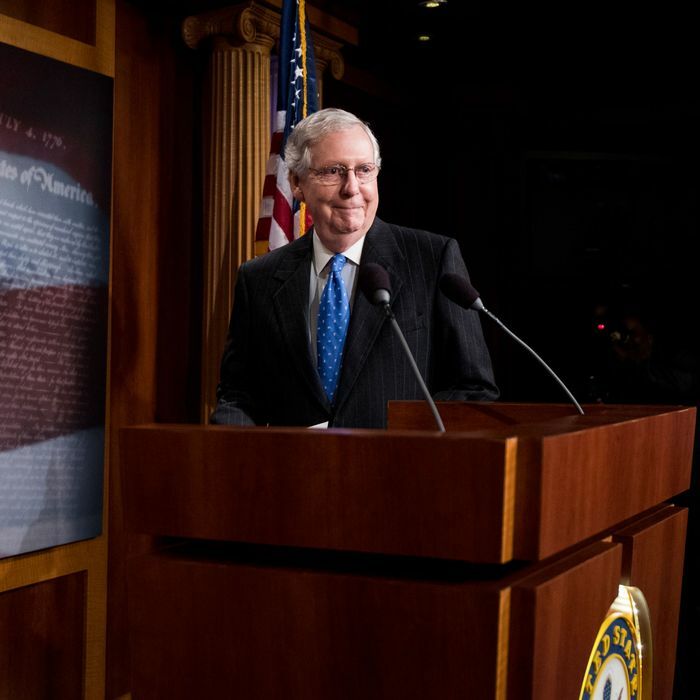 Senator Mitch McConnell: statesman, author, beloved American. Photo: Bill Clark/CQ-Roll Call,Inc. The Republican majority in both houses of Congresses has followed a rigorous policy of refusing to conduct any oversight of the Trump administration. Voters deposed the Republican majority in the House. The Republican majority survived only because its elections happened to be staged this cycle disproportionately in seats held by Democratic incumbents, many of them deep red. That message may have been lost on a few House Democrats, who have made clear their preference for investigations over policy results. The first sentence establishes that the American people made their preference “clear” through the election results. The very next sentence acknowledges that Democrats made their desire to investigate Trump “clear.” So, maybe by voting to give the majority to the party that was clear about the need to investigate Trump, the American people were pretty, uh, clear about what they wanted?